So you want to join a bootcamp! Spring is well and truly here, the flowers are blooming and the sun is shining (well some of the time). You have been stuck inside for months with your baby and you're ready to be set free! There are so many spring/summer exercises classes you can choose from, which is GREAT! But how do you know what is going to be right for you? Its useful to do a little research into the sessions and the instructor before you sign up. As a newly postpartum mom its important to take control of your health and source out the BEST fit for you and your baby. Also, just because a bootcamp/stroller fit session is targeted at new moms, doesn't meant it is right for you! Yes they are fun and yes they are challenging, which may appeal to you, but the intensity can cause some major complications for a new mom. The core and the pelvic floor needs to be functioning properly before starting something too intense. If you have any sign of pelvic floor dysfunction, it needs to be addressed and well managed. Just because there are no obvious symptoms, doesn’t mean that nothing is happening. As a new mom, unfortunately exercise isn't a one size fits all...something one mom can do easily, another may not be able to. The instructor should understand this and be able to make the correct adaptions for your needs. BUT they need to know you first. Follow these simple guidelines to help you find the right fit for you and your exercising needs!! 1. Ask the instructor/personal trainer questions. Let them know what your ability is and what issues you still have (such as pelvic organ prolapse, urinary incontinence and diastasic recti). If they don't know how to adapt the exercises for you, then its the wrong instructor/personal trainer. Ask them about their qualifications. Have they done any specific postnatal certifications? Most importantly, do they know about pelvic floor dysfunction and how to train it? 2. Is there a pre-screening process? The best sessions will include a pre-admission questionnaire, including questions about your birth/recovery. Some classes may require a visit to a physiotherapist before joining depending on the answers you give. 3. Is it a pre-set class or a drop in class? The drop in sessions can be a little risky depending on the style of session. If it is designed for new moms then it MAY be ok (but still ask questions). But if it is a mixed group/anyone can come...be a little wary. Pre-set sessions are the best for new moms so you can progress at the same pace. 4. Avoid certain exercises until you know for certain you are fully healed. If you are in a session and theses exercises come up...avoid doing them and ask for adaptions. Crunches/tradidtional ab exercises, plank/push ups (unless they are done on an incline), lifting too heavy, jumping and running should be avoided UNLESS you have been fully cleared by a physiotherapist. Ask yourself do you still leak urine? Do you still have pelvic/hip pain? Do you feel heaviness in your pelvis? If your answer is yes to any of these questions then DO NOT do these exercises. Don't put your health in someone else's hands unless you are certain they are the right fit for you. You could end up doing more harm than good. Happy, Healthy, SAFE workouts mamas!! So I've been cleared for exercise...now what?!? So you have been given the all clear from your doctor, now what do you do? In my experience, when I was given the all clear, my OB told me NOTHING about what I could and couldn't do regarding physical activity. He didn't check the health of my pelvic floor, nor did he check for diastasis recti. If he did check, he was wrong. He told me everything was great and I can get back to my normal routine. Now, Im not sure if he told me this because he knew I was a personal trainer or just because thats protocol. 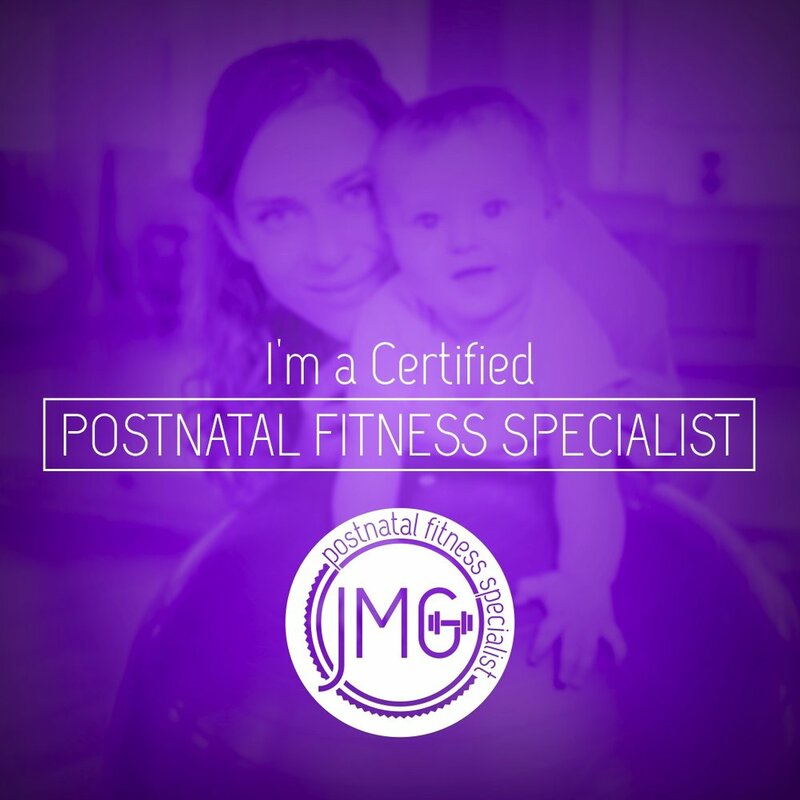 Even though I am a personal trainer, I wasn't 100% certain I knew what to do regarding postpartum exercise. So I tried getting back to my normal routine and that was a DISASTER! It wasn't until I was struggling through my usual exercises that I realized something wasn't right so I started to do my own research into what I should be doing or what was wrong. There are some wonderful women and businesses out there which lead me to the discovery of diastasis recti and pelvic organ prolapse, along with a few other issues some women get postpartum. Links are at the bottom of this post. Regardless of whether you have any or no symptoms postpartum, there are right and wrong ways to get back into exercise. If you have a weak/sprained ankle would you start jumping up and down on it telling yourself it will get stronger? No, you would start with rehabilitation exercises to ensure it was healthy before you started hopping on one leg. Well your pelvic floor and core are the same, they need rehabilitation (after the rest period) to start regaining proper function. Now, these rules are not going to be forever. BUT you need to be aware of your body and what it is telling you. Work with a pelvic floor physiotherapist to assess which stage you are at and with a personal trainer who knows about the woman's body postpartum. This way exercises can be integrated when YOUR body is ready. Forget watching the #fitmom and #pushyourlimits craze on social media Do what feels right for YOU and YOUR body! The importance of Diaphragmatic Breathing. After I had my daughter Eden, I didn't realize how important breathing was for postpartum recovery...I wish I had learned this info while I was pregnant. I had a really tough recovery and wasn't prepared for the toll delivery took on my body. I really struggled to get back into exercise postpartum because I had undiagnosed diastasis recti AND and an undiagnosed prolapse. Luckily due to ankle injuries I had been told no jumping so I didn't make my prolapse worse. But it wasn't until wayyyy into my postpartum recovery that I leaned all this information. I struggled mentally with not being able to perform as well as I could before. All this together meant I had to figure out what was going to work for me. I did so much research into the human body postpartum and which exercises would help or hinder recovery. I changed my exercise routines and started to heal my diastasis. I was still so scared about the prolapse I didn't really know what to do (so I set that aside for a while). It wasn't until 18 month postpartum that I discovered this was what I really wanted to help women with. There Is so little help given from your family doctors/OBGYNs, especially if you don't know the questions to ask or they rush you out of the office after a check up. I had been following the teachings of Bellies Inc and decided to take their course to become certified in core rehabilitation. However, you can re-train your body into functioning correctly. The first step is with your breath. You can start this as soon as possible, pregnant, postpartum, trying to get pregnant, the sooner the better. Watch the video for a demonstration of belly breathing/diaphragmatic breathing and start practicing NOW!! I cannot stress how important breathing is for effective core function so PLEASE if you are only going to change one thing in your exercise routine...start with this! start with 10 breaths per day and slowly increase as you get the hang of it. Sit on a stability ball, chair or lay on your back, with a slight arch in your back (finding neutral spine), two feet are on the floor (knees bent if lying down) and look straight ahead. Place one hand on your belly and the other on the side of your ribcage. Take a deep breath in. Focus on filling the space in your ribcage without your chest rising (imagine your ribcage as an umbrella), fill your belly and in vision your pelvic floor soften and relax. Feel as your ribs and belly expand as you take in air. Breath like this a few times so you can get use to filling your belly and ribcage with air before moving on to the next step. Your belly and ribs should be moving in unison with 70% of the air going into your ribcage. As you breathe out, feel your ribs and belly move in (umbrella closing), exhale through pursed lips. Take a few breaths like this as you begin to understand how your body is moving then add in the pelvic floor contraction. As you exhale, feel as your pelvic floor lifts away from the ball or chair and draws in. Use nice slow breaths, focus on slowing the breath down and engaging the muscles as you breathe out. Remember as you inhale, to soften the pelvic floor. Only after you have perfected the first three steps, should you progress to this step. As you close your umbrella and pick up your blueberries, exhale through pursed lips. You should feel a band of tightness across your lower abdominals. This band of tightness is your transverse abdominis contracting and completes the optimal “core” contraction. You can feel the activation by placing your fingers on the inside of your hip bones. NOTE: this is a gentle contraction. • Imagine a guy wire between your two hip bones and as you exhale, create tension in the wire. The great thing about core/diaphragmatic breathing is you can start it as soon as you feel comfortable post delivery. If you don't want to include the pelvic floor right away that is FINE you may still be tender. If that is the case just focus on breathing into your belly and ribcage and fully relaxing your pelvic floor. Listen to your body, don't rush and don't push too hard, you have just given birth!